San Martino was a hub of Medici patronage and charity, two concepts that shaded into each other quite easily in Renaissance Florence. Charity was seen as both a civic good and a means of personal salvation for the wealthy. In the austere words of the Dominican preacher Antonino, who founded the Buonuomini, in 1442, and would soon be the city’s archbishop, the rich were not rich “so that they may dissipate it in dogs, falcons and horses, extravagant dress, games and banquets … that of the goods given them by God, they should take what they need, and the rest should be given to His poor, and by the virtue of charity they should be received into the eternal tabernacles, through the prayers of those poor”. To begin with the poveri vergognosi or “shame-faced poor” meant the working poor, and those who received aid tended to be artisans in the textile industry. Food prices, delayed payments for work or sickness could quickly make life impossible for this section of society. This continued into the late fifteenth century, but the balance had shifted by Giovanni’s era towards helping better-off citizens who had fallen on hard times. In this way the net of Medici patronage was cast very widely indeed – and what Lorenzo and his allies implicitly sought was not only salvation in the next life but loyalty and support in the earthly republic. Inside the oratory (open 10am-noon, 3pm-5pm) the walls are frescoed with the Buonuomini, who are still going today, carrying out classic acts of charity, such as burying the dead, visiting the sick and releasing prisoners from debtors’ jail. These are rare representations of the “poor” in Florence. Outside, around the church, the street singers, musicians and poets gathered. 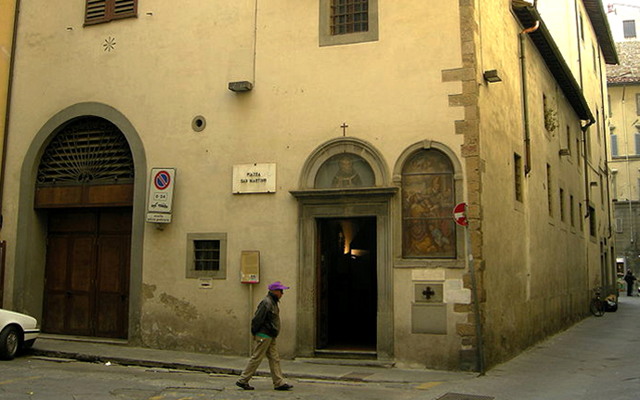 This was Florence’s principal venue of street performance, a popular culture also patronised by the Medici and others. Most of the performers were artisans, the best-known of whom in Giovanni’s time was Cristoforo, know as L’Altissimo (the most exalted one). “I have in this street in this small piazza / an audience so great and happy, that it would make nor just me but a stone proud,” he says, insisting on the “nobility of excellence” that poets such as himself belonged to. Socially, this audience was highly eclectic, which meant that, around a shared culture, this piazza could became a space of connection and community in the factious renaissance city.